Every time people ask what I do for a living and I answer "translations" everyone seems very impressed. They go ahead asking more about which languages I speak and they end up saying: "Oh, I wish I could speak so many languages..."
For many years I thought to myself that learning a new language is actually a "piece of cake". I even felt many times that I was under-qualified because I had "only" studied languages. So I worked hard to acquire new skills that would make me more marketable. But some time ago something strange happened: I tried to learn a new language, Japanese, and it's hard! I love this language, I take tea ceremony classes with a Japanese master, I found the best online resources for learning Japanese (just to give you an idea of how good they are: I learned to read Hiragana and Katakana in 2 weeks) BUT, for some reason, I always give up! 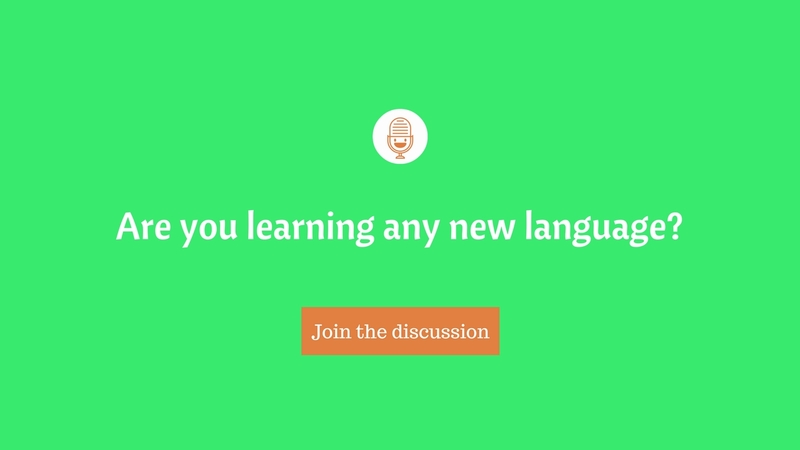 Are you also trying to learn a new language and finding out that it is much harder than you thought? ClaudiaBefu What is wrong with me? Nothing is wrong with you @ClaudiaBefu! I've had the same experience with French. Tried to study it but given up rather quickly. I think it might be because you already have a couple of languages and you don't have enough motivation to add another one. It's not like your life depends on knowing Japanese, right? So it's very easy to say: "Oh, I'm tired, I'll do this later" and then forget about it completely. I think it's much easier to learn a language when you're a kid or a teenager as there's enough room in your brain and you don't have all those other responsibilities like kids, family, work, cooking, etc. So maybe that's why you think that second language is harder than the first one. I can relate a bit to your story. There is this Korean variety show called Running Man that I have been watching for a few years now or I would sometimes subtitle a Korean movie. I got to understand the basics, some common words or phrases but somehow, no matter what, I still can`t read Hangul or seem to progress somehow. I was always the kid passionate about languages that used to go to all the language competitions in my school. I am also a bit surprised as I would always be a sponge when it comes to anything related to languages. OANA Could it be that Asian languages are simply harder to learn than what we're used to? On a brighter note, while trying to learn Japanese I realized that there are so many people outhere developing cool methods for learning languages. Are there any cool online resources for learning Korean? ClaudiaBefu I thought so too but I am very stubborn, so I take it as a challenge but it`s not really a priority for me right now. It is a free course but if you want a certificate of completion you have to pay and upgrade. It is offered by Hanyang University and that`s what caught my attention. Duolingo.com is probably also worth a chance. I completely understand what you mean, as I'm currently trying to learn Japanese as well, finding it ridiculously hard. Not only you need to learn loads of Kanji, but even many different readings, too, which is one of the most difficult parts in my experience. Besides it requires more time to even reach an intermediate level, because everything is just too different to what I'm used to (and most native speakers of European languages). I love Tofugu, too! I also use this for Kanji: https://kanji.koohii.com (a Kanji database which collects stories to help memorize them, like Heisig's method, but with many more stories to choose from, plus the forums are really helpful). Teresa Konnitchi wa (Brazilian time) or Gonban wa (Italian time), Teresa-san! I studied Japanese for six months, learnt the basic katakana but have seen some kanji - they look very complex! I love languages and would like to learn something to boost job prospects. Possivelmente tornerò a studiare l'italiano, or maybe Esperanto! Thought of Slovenian but the grammar is too complex. It's so great that the Internet offers us so many means to learn new languages! I know Memrise which is a tool for learning vocabulary, I used it in university for Finnish (which was scaringly difficult!). @ClaudiaBefu @OANA @Teresa It's amazing that you're learning Asian languages, I find them too hard! Me neither! I'm trying to improve my French and start learning Portuguese. I already speak Galician, which is a regional language in Spain (I live next to the border with Portugal). A few centuries ago Portuguese and Galician used to be the same language, so yes, I'm going with the easy ones for now But if I ever want to practice, it's only an hour's drive to Portugal! eleonorang Well, you seem to be pretty heavy caliber yourself with Finnish. I think that must be a VERY difficult language to learn. It has so many vowels... why? Do you have some good stories from learning Finnish? ClaudiaBefu thanks! I hope to get to the same level I have in English, but I know it'll take me years!! ClaudiaBefu It has so many vowels... why? Good luck with French... my first foreign language. I still remember my teacher, she seemed amazing to me as a 9 years old girl... Good times! March_ts But if I ever want to practice, it's only an hour's drive to Portugal! About Finnish... well... I wasn't brave or anything, I just had NO clue of what I was getting into! lol I'd heard about the many cases but, to be honest, that wasn't the hardest part. Learning suffixes is not so different from learning prepositions, after all. The major problems were vocabulary and, of course, speaking. Vocabulary because, like @ClaudiaBefu rightly said, there are so many vowels. Our teacher told us Finnish is considered the "Italian of the North", because like my language it has so many vowels - and that made it only more frustrating Memorizing words in Finnish and distinguish them was truly difficult (that's why I used Memrise). And speaking - because you cannot truly reach a decent level in a language unless you get to speak it, and there weren't that many Finns in the Bologna area... The only people I know to have achieved a decent grasp of Finnish went and spent some time in the country, for example with the Erasmus programme. eleonorang The major problems were vocabulary and, of course, speaking. Looks terribly difficult! It's such a scary language! But it's worth it! In the end, language is what defines us, as humans. Oh yes, I love Japanese crazy! It's not illogical at all, actually Have you recently downloaded or updated their mobile app? There's a whole storytelling approach about you needing to learn words to get back to the mothership (in an outer space context) Really fun and creative. It makes the difference. Dmitry I think it might be because you already have a couple of languages and you don't have enough motivation to add another one. I came across this article today and remembered our conversation about the difficulty of learning a new language so I decided to share it. It is a pretty complex analysis/comparison, with languages analyzed according to vocabulary, grammar, discussing pronunciation and the difficulty of learning in general. OANA I came across this article today and remembered our conversation about the difficulty of learning a new language so I decided to share it. Great article, thanks for sharing Oana. If German was slightly difficult, than I'm in trouble! Dmitry Nothing is wrong with you @ClaudiaBefu! I've had the same experience with French. Tried to study it but given up rather quickly. In my case, it was German. Dmitry think it's much easier to learn a language when you're a kid or a teenager as there's enough room in your brain and you don't have all those other responsibilities like kids, family, work, cooking, etc. I totally feel with you, Dmitry! And you made another good point: adults take longer to learn languages, because they keep their brains too busy. There was this yogi, Krshnamacharia, he actually created the Ashtanyoga series, and when he walked on the streets he would look at the ground. He didn't want to fill his head with so many impressions. Brainpower is really important: what do we choose to use it for?